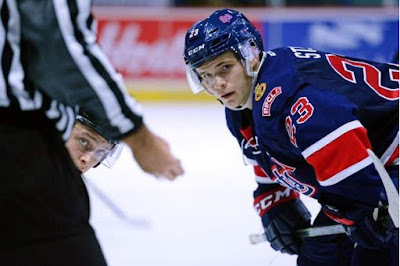 Calgary, AB - The Western Hockey League announced today that Regina Pats forward Sam Steel has been named the WHL Player of the Week for the week ending October 2, 2016. Steel registered seven points (4G-3A) in two games to help the Regina Pats go 2-0-0-0 this past week. On Friday, September 30 against the Edmonton Oil Kings, Steel scored twice in his 2016-17 debut while earning second star honours in a 6-3 victory. The 18-year-old product of Sherwood Park, AB, concluded the weekend with a five-point effort (2G-3A), earning first star recognition in a 7-2 triumph over the Red Deer Rebels on Sunday, October 2. With four goals to his name, Steel is currently tied for third in WHL goal scoring. The 6-foot, 180-pound centre was returned to the Pats from the NHL’s Anaheim Ducks last week. A first round pick (30th) of the Ducks at the 2016 NHL Entry Draft, Steel is entering his third WHL campaign. He has collected 131 points (44G-87A) in 140 career WHL regular season contests. The Regina Pats return to action Friday evening at 7:00 when they host the Kootenay Ice. On Sportsnet website, poll from all WHL coaches believe the Pats will win the Memorial Cup this year, more votes than London Knight's. This is the year. Congrats to Sam with his first 2 games output, go Pats go!